Trapped in the streets of Barcelona after falling victim to a heinous crime, without a passport or money, patience is Rudy’s only hope to make it out alive. Plunged into a world of street-dwelling derelicts in a city whose language he does not speak, struggling to maintain his decency and humanity while fighting off the ravages of slow starvation, patience proves to be an exhausting path. This is a story of human spirit in the face of the odds of survival stacked against him. This is a story of humanity’s worst nemesis – itself. It is the side of Barcelona you will not find in any tourist guide. A: First of all, please allow me to express my gratitude for inviting me here. I consider myself a Renaissance man of sorts, which is just a fancy way of saying that I try to get myself into as much trouble as possible. On the creative front, I write, work with wood, garden, paint, and design a multitude of things that are completely unrelated. One of my hobbies not related to literature is restoring old motorcycles, altering their aesthetics and breathing new life into the old machines. When not doing any of the above, I try to escape into the unknown, exploring old carriage roads on two wheels (motorized) and stay as far away from the noise of civilization as possible. A: I started writing in my early teens, but I have nothing to show from that period. I wrote short stories, little snippets of imagination, thoughts, and poetry. I kept a few of my old poems, but most of my early writing has been destroyed in one time or another, when I had a 'fit' and burned everything I wrote. A: My most recent release is Eluding Reality, the final book in the Mad Days of Me, trilogy. It follows Rudy, the main protagonist, on a journey to rediscover himself and find peace. In the first two books, Rudy had to deal with some rather unfortunate circumstances, and it was nice to complete the third book and address all of the open questions. A: I would have to choose the first book in the Mad Days of Me, trilogy: Escaping Barcelona. This was my first completed novel, and I'm quite pleased with both the book and the way it has been received by readers. A: I'm a little torn here. Rudy, the main protagonist in the trilogy is, by far, the most prominent character; one I spent the most time with. Is he my favorite? Probably, if for no other reason then because I had him in my head for close to six years. That being said, I grew fond of Dominica (she is featured in books two and three), because she is a troubled, kind soul. A: The most challenging aspect by far was research. The trilogy spans multiple locations, and covers several incidents that change the protagonist's psyche. Since it is written in a first-person narrative, I could only disclose what Rudy sees, hears, and smells. I spent days staring at maps and photos, walking the streets Rudy walks in the trilogy. For the psyche part, I read accounts of people in similar situations and studied personality traits so I could relate to what Rudy would feel. A: Honestly, no one has ever asked me that. Part of it is to take the readers on a journey, to pull them away from the mundane and show them a side of humanity they would not encounter otherwise. At the same time, it is to provide readers with something to think about, and hopefully enrich their perspectives. 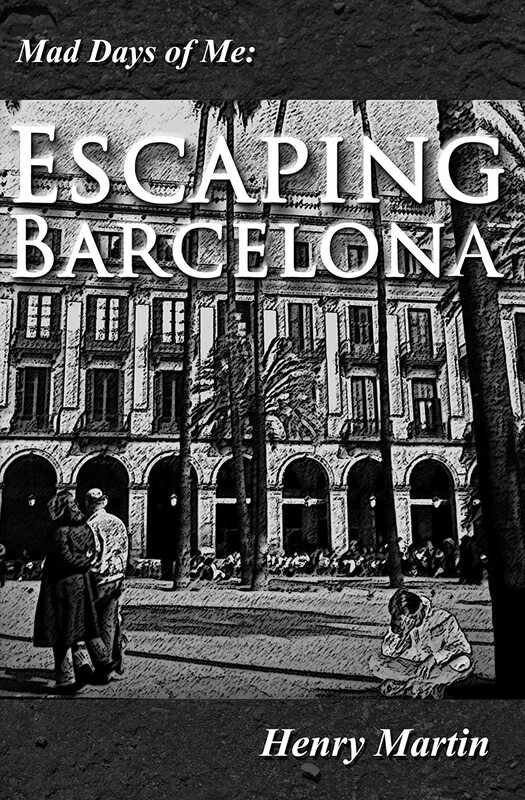 Back in 2007, when the first edition of Escaping Barcelona was released, reviewer Richard Blake wrote: "After reading the book, I have new insights into the plight of the homeless. I am not as quick to judge as I do not know their circumstances nor have I experienced the difficulties they must face in a day to day turmoil of hunger, pain, and rejection." I remember reading that and feeling pretty darn good. A: I must admit that, at this time, my mind is rather cluttered. I'm currently working on a new novel I call 36 Days. Set in an immigration center somewhere in Europe (location undecided) it will attempt to address the psychological deterioration of a man who landed in one of these centers due to mistaken identity. Since these centers are of non-penitentiary nature, the detainees are often in a legal limbo, without access to basic services such as translators or public defendants. I'm trying to portray the interactions of the protagonist with those he encounters between his arrest and his release, from the wardens to the detainees from varying backgrounds and cultures. At the same time, I've been toying with the idea of a short book of essays and thoughts. Something in the realm of The Book of Disquiet by Fernando Pessoa, or, perhaps, other more surreal works. As I said, my mind is cluttered right now. A: Read, write, and persist. Success does not come overnight, and may never come. But if you do what you love, if you put forth your best effort, at least you can be at peace with yourself.